​Hold your place in line for a kitten sign up now! Can you train your kitten check out the answer in the cute video below. Can you train one of my Bengal kittens see video below! 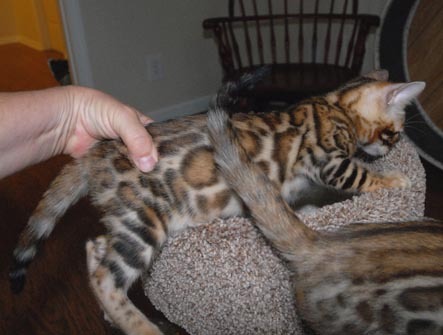 Exquisite Bengals to buy are not inexpensive, you generally get what you pay for!! It is true, you can find Bengal kittens priced lower, but in most cases, these will not have the bright colors and vivid markings that you see on Bengals pictured on websites and in magazines. Nor would you find healthy kittens where parents have been tested for Heart, Kidney and eye problems. There is a lot of expense involved in raising quality kittens, more than most people realize. Our kittens are individually evaluated and priced accordingly. 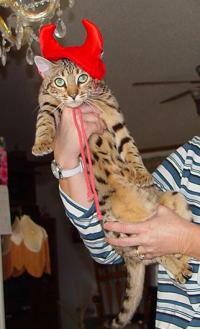 Those that meet the Bengal standard, have the best markings, pattern, coloration and conformation. We have two spotted boys. Meet Mr "Alex"
Sherry Lynn Available Shown Below.. Growing like a little weed. So cute and the runt of the litter. All that Jazz and her companion Cazpurr Cloud's kittens were born on March 2nd we have SIX (6) little ones. Four girls and 2 boys. I can't wait to see what his markings will look like! All of the following kittens have been picked out. The following kittens are sold and picked out! Going to a breeder home! Congrates Kelly! Girl Two shown below "Sweet Baby Jane"
Can you train My cats. Watch this video of Cats! Do Kittens like their wheel! What do you think? ﻿Our kittens are raised in our home and under foot. Our kittens come with a written health guarantee. Kittens are held by deposits only and deposits are absolutely non -refundable! You pick your kitten by your place in line. Please contact me on actual prices. If you wish to purchase a Cazpurr kitten: Click here to make a Deposit. We do ship but mostly in the USA. Sign our waiting list form! I appreciate you taking the time to visit my site and check out my Adults and kittens. I can only say to you that my cats and kittens are raised in my home. I don’t have some large cattery outside with more cats than you can count that are not on my site. I am a very small hobby breeder that love's to go to the cat shows and on occasion work with the Judges as a clerk at the shows. My cats and kittens don’t fade out at a year old, or get dark in color as they age. Please note: Not all Bengal's back grounds are the same!!!!!! If you don't like how the parents look ... You won't like how your kitten turns out. Try to do your best homework when purchasing a life long family pet member. I am a tester of HCM (heart problems), PK (kidney) and FELV-FIV yearly… on all my Adults cats. Please make sure the breeder you get is a current tester... and require to see the results of their testing. If they really do test they should not mind sending you a copy of their tests. This testing allows me to know when I sell you a kitten I have done my best to give you a healthy kitten. You will pay my price or more with any breeder out there. Honestly! Don’t you want the best for your family and out of your pet. If you do, you have came to the right place. I take pride in my cats and kittens and have been breeding for over 20 years which allows me to stand behind my guarantees to you as a pet buyer. I am not going anywhere. How about you??? ?